December 20, 2006 — They appear as two line items in a final transfer list between the space shuttle Discovery and the International Space Station: items 811 and 811.1. Uplinked to the shuttle crew as a final preparation for the undocking of Discovery from the station on Tuesday, the list identifies 811 as Suni Williams, FE-2, and 811.1 as a ponytail. Sunita 'Suni' Williams is the latest member of the station crew, having arrived with Discovery on December 11. Her title aboard the ISS is Flight Engineer-2 (FE-2). "Remove ponytail from 811 prior to transfer of 811" reads the resupply transfer list. "Report final stowage location." "We believe 811.1 has been completed, please confirm," ground controllers wrote to the crew elsewhere in the list. Williams, who arrived at the outpost last week with long flowing — and floating — hair, arranged to have her locks cut last Sunday and the clippings stowed on Discovery for a future hairpiece to be given to a child suffering from long-term medical hair loss, collectSPACE has learned. Mission specialist Joan Higginbotham, who worked with Williams on the station to operate its robot arm and who led the effort to transfer supplies, including William's own items, from Discovery to the ISS, served as hair stylist for the orbital trim. William's new hairdo was noticed soon after by mission control, who commented on it but made no mention of where the separated strands were destined. Sources close to Williams told collectSPACE.com that the astronaut intended to donate her hair to a charity that would donate it to an ill child. On Wednesday, NASA confirmed that Williams' donation would be made to Locks of Love, a Lake Worth, Florida based, non-profit organization that provides hairpieces to financially disadvantaged children under age 18 suffering from long-term medical hair loss from any diagnosis. According to Lauren Kukkamaa, communications director for Locks of Love, this is the first time they've received a donation of hair from an astronaut in space. While normal constraints would preclude tracking Williams' hair through it being made into a prosthetic, the unusual nature of this gift may mean special attention. "Its definitely something that is, of course, new to our organization, to receive hair that is from space. I know it would be exciting news to let our supporters know and I know they would be very interested," said Kukkamaa in an interview with collectSPACE. Once Williams' ponytail is received by Locks of Love in Florida, it will be measured for its length and then sent to their manufacturer in California. "At that point, it will actually be combined with six to 10 other ponytails to make the hairpiece," said Kukkamaa. Williams' ponytail recipient will be chosen by the options the child selects for his or her hair, such as its color and length. "It will [then] be hand-stitched or hand injected in to a silicone fit cap with about 150,000 other strands of hair," she explained. "Because it is made from a silicone cap, which is actually made from a mold of our recipient, it is technically a prosthetic. It will create a suction or a vacuum fit, so it is very different from a wig," Kukkamaa said. "At that point it cannot be pulled off by anybody else and they can play sports with it on, go swimming, basically do anything with the hair." 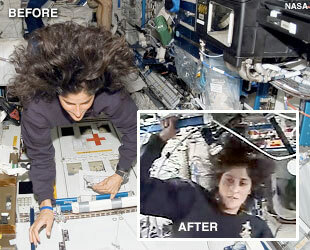 Williams' ponytail will land with the STS-116 crew, who is presently scheduled to return to earth on Friday. Williams has just begun a six month stay on the space station. 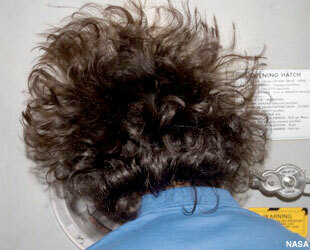 It's not uncommon for astronauts to have their hair cut in space, especially during long duration missions, but the clippings are generally discarded. Williams is very attached to her hair, but it's not the first time she's had put it on the line for a good cause. It even led to her becoming an astronaut. According to her NASA profile, Williams originally wanted to be a veterinarian and had chosen Columbia University in New York to achieve that goal. She was also however, considering the Navy. "I had long, long hair and I was like, 'Aw, I don't know if I could go there and cut my hair,'" Williams described of the Naval Academy. "But I think I was a little scared to go live in New York City. So I chose the Naval Academy — that's less scary than New York City."